This is a easy, quick-sewing project for newer seamstresses, craft-fair sellers, and all nostalgia -loving doll aficionados. 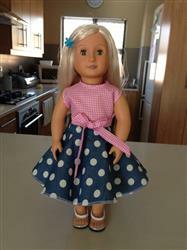 Both the Front and Back Bodices fit around the doll with ties, which means that the top will fit older, chubbier dolls as well as newer ones that prefer to eat salads. 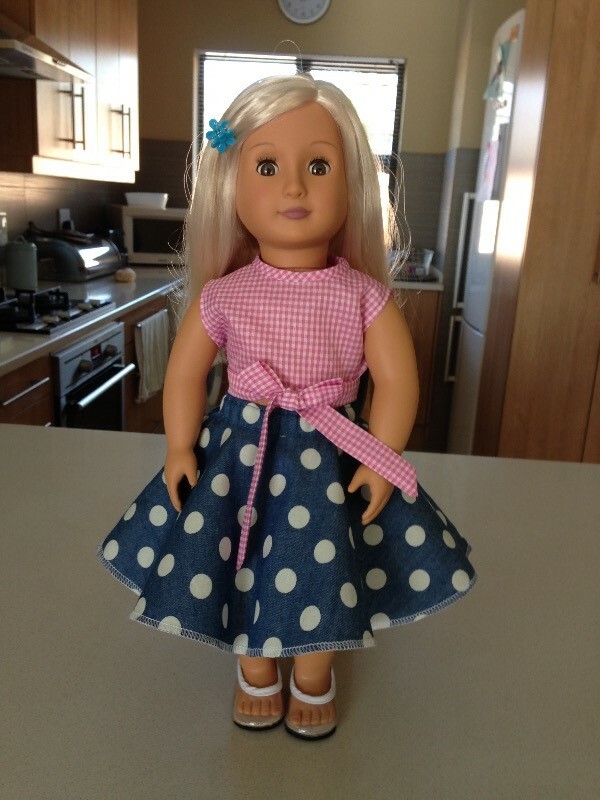 It will also fit Journey Girls® dolls as well. Two neckline variations are included in this PDF pattern, as well as two lengths for the longer ties. The directions have been written comprehensively with many explanatory details for those who are newer to sewing. An experienced seamstress will probably be able to construct the blouse just by reading the instructions highlighted in bold text. Happy sewing! Looking for the skirt shown with this top? Check out the Elastic-Back Circle Skirt to complete the look. Lightweight woven fabrics with a bit of drape. Lightweight quilter's cotton, lawn, and medium-weight batiste are appropriate. 4. Optional: ¼" ribbon can be substituted for the Front A Ties. 1/3 to ½ yd. will be enough. Easy pattern to sew & love the look. Fun to make. Will make another one. This is very cute, well illustrated and perfect for your Spring and Summer wardrobe! Easy to do, I highly recommend. Nice, easy pattern, great step by step instructions. Suggest making it just a little longer (I made the short version) because the doll's label tends to show.